Hi everyone! 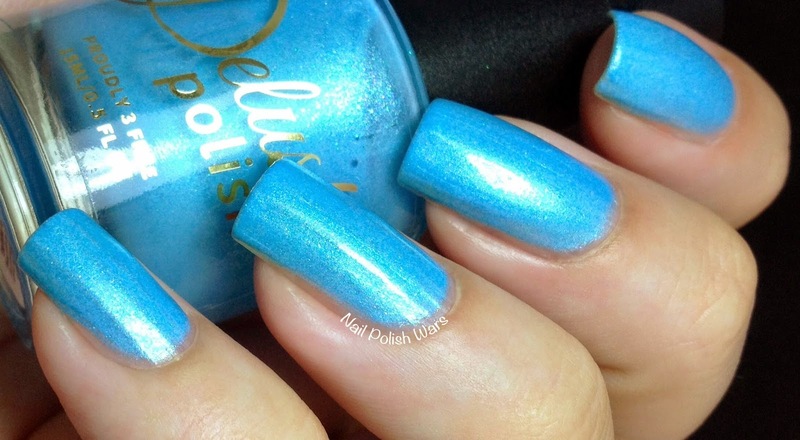 I have the new Essence of Summer Collection from Delush Polish for you today! Bombshell is a medium satin pink with a subtle light blue glass fleck shimmer. The formula was smooth and easy to apply, but was a bit on the sheer side. This is such a fun shade to wear! Shown is three coats of Bombshell. Brazen is a soft orange satin with a gold glass fleck shimmer. The formula was smooth and easy to apply, but was a bit on the sheer side. I just love this shade! It has such a great creamsicle quality. Shown is three coats of Brazen. Indulgence is a bright watermelon satin with a soft violet glass fleck shimmer. The formula was smooth and easy to apply. This shade really pops! Shown is three coats of Indulgence. It's About Thames is a medium sky blue satin with a soft aqua glass fleck shimmer. The formula was smooth and easy to apply. This will make such a perfect shade for a poolside day! Shown is three coats of It's About Thames. Orchid Situation is a soft orchid satin with a pale green glass fleck shimmer. The formula was smooth and easy to apply, but was a bit on the sheer side. I love how delicate this shade is! Shown is three coats of Orchid Situation. Shake Your Teal Feather is a medium aqua satin with a soft violet glass fleck shimmer. The formula was smooth and easy to apply, but was a bit on the sheer side. I like this shade a lot!! Shown is three coats of Shake Your Teal Feather. Swans Upon a Time is a white satin with a soft pink glass fleck shimmer. The formula was smooth and easy to apply, but was a bit on the sheer side. 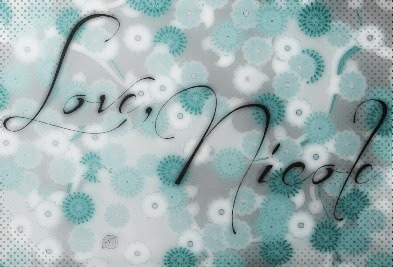 I just love this one! I'm so mad for awesome whites right now! Shown is three coats of Swans Upon a Time. You Glow Girl! is a soft yellow satin with a soft pink glass fleck shimmer. The formula was smooth and easy to apply, but was a bit on the sheer side. This is such a sweet and sunny shade! Shown is three coats of You Glow Girl!. 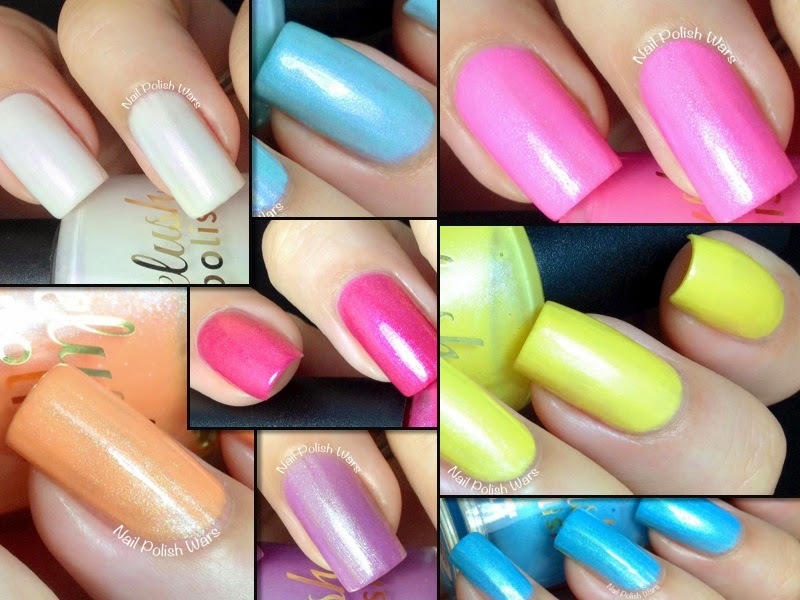 You can find these and other great Delush Polish shades at their storefront here, and be sure to check them out on Facebook for all of their latest updates and collections. Be sure to check out all the details on their new rewards program as well! Great shades for the summer! Brazen, Swans Upon a Time, and Orchid Situation are my favorites - they are so pretty! Brazen is my absolute must have - love it! The rich pink and pale blue are my favorites! Good job!